Jim Byrnes’ fame as an actor has grown immeasurably from his too-numerous-to-mention TV roles, highlights including television’s Wiseguy and Highlander series, and his national variety show The Jim Byrnes Show. Jim has proven that a serious car accident in 1972 has done anything but hinder him. Despite two swipes with death and some pretty hard knocks, Byrnes has still managed to rack up an enviable string of credits, both on and off-screen. Jim’s first love, however, is the blues. His evocative, smoky vocals are found in a truth that doesn’t come overnight. In 1981 he released ‘Burnin’’, followed in 1987 with I’ve Turned My Nights into Days and 1995’s Juno-Award winning That River. Jim’s has produced four outstanding albums in six years since he hooked up with Steve Dawson, one of North America’s most critically acclaimed roots music producers. 2004’s Fresh Horses and 2006’s gospel tinged Juno Award winning House Of Refuge set standards that aren’t often equalled. My Walking Stick was the 2009 release ... a blood and guts, behind your knees, love, life, death, and after life release from the multi award winning Mr. Byrnes. Jim and Steve continued to explore the gospel, blues, rockabilly, and country genres, and once again pull it all together in an original and unique bluesy way. A little more than a year later, the same team got together and produced Everywhere West. A salute to Jim’s origins and influences, the CD sprinkled three exciting new originals in amongst tracks by seminal blues artists. In 2012, Jim decided to record I Hear The Wind in the Wires, an album of songs from the golden age of country music – many of which he’s been listening to for all his life. This time around, he turns back the hands of time to take his listeners into the world of country music, but it’s not the kind of country we’ve heard on the radio any time this century. This is surely the most natural, satisfying and downright joyous album of Byrnes’ lengthy career. Steve Dawson is back in the saddle again as producer and multi-instrumentalist (electric, acoustic, slide, pedal steel and baritone guitar, banjo, ukelele). To hear these two men celebrate the music of Buck Owens, Ray Price, Hank Williams, Marty Robbins and other country music legends is a rare and exhilarating experience. Every now and then, if you’re lucky, you’ll hear a voice that changes the way you think about music. It’s that rare kind of voice that can take you out of yourself to a place where a song that you’ve heard a thousand times becomes brand new again. Jim Byrnes’ voice has that quality, and even though he’s been winning over audiences with his soulful vocals for more than fifty years now, he’s never sung like he does on Long Hot Summer Days, his newest album on Black Hen Music. At age sixty-nine, Jim Byrnes has recorded a career milestone, which, given his history with numerous Juno Awards and Maple Blues Awards, among many other accolades, is saying a lot. But, if you listen just once through Long Hot Summer Days, it’s easy to be convinced that there simply isn’t anyone alive today who loves a good song more than Jim does. It’s an amazing thing to hear a performer who, well into the fifth decade of his career, the veteran of thousands of live performances and dozens of recording sessions, continues to approach creating a new album with the dedication and enthusiasm of a twenty year old. >With a love of music as vast as Jim’s, it’s not surprising that Long Hot Summer Days covers a lot of territory. From the spare and haunting rendition of Willie Dixon’s ‘Weak Brain, Narrow Mind’ captured to tape with one microphone 30 feet away, to the rich full band sound of ‘Ninety-Nine And A Half’, ‘Long Hot Summer Days’ is a master class of song interpretation. When Steve and Jim began to choose songs, Jim kept circling back to things he first heard on the radio while driving around his native St. Louis during his high school days. On the top of his list was ‘Something On Your Mind,’ a soul hit by Bobby Marchan. ‘Ain’t No Love In The Heart Of The City’ recalls the relaxed, assured style of Bobby Bland, and Jim’s interpretation of ‘Out Of Left Field’ would do Percy Sledge proud. For blues purists, there is a riveting single-take version of Elmore James’ ‘Something Inside of Me’ that should put to rest any doubts that Steve Dawson is one of Canada’s greatest guitarists. Warm and weathered. Soaring and bright. Long Hot Summer Days is a masterwork from one of Canada’s best-loved musical icons. Records like this don’t come around every day. Listen and be taken away. Jim Byrnes lives and breathes music. For nearly fifty years he's crooned, drawled, belted, hollered and sweet talked more songs into a microphone than most people ever get to hear in a single lifetime. He's vibrated the rafters of saloons, pool halls and dance floors from one end of the continent with more styles of music than you could shake a stick at. It doesn't matter whether it's (he's doing) low down blues, gospel, R&B, old time, swing, country or good old rock and roll – when Jim Byrnes sings, it's the real deal. St. Louis Times is the sixth album that Jim Byrnes and Steve Dawson have recorded together and its release coincides with the tenth anniversary of their partnership. With that in mind, Dawson gathered some of the best roots musicians in Canada together for a super session to record the basic tracks for 'St. Louis Times' on vintage equipment in a big old studio blessed with brilliant ambience and acoustics. As usual Dawson's signature string work rides shotgun through 'St. Louis Times' and has never sounded more right for Jim's songs, while Darryl Havers' innovative keyboard work and the rock solid rhythm session of Jeremy Holmes on bass and the tireless Geoff Hicks on drums gracefully support every track. Horns from a host of legendary Nashville players provide depth and texture on many of 'St. Louis Times' best songs. As spot on as Byrnes' choice of classic songs from St. Louis' heyday is, the thing that many of his fans look forward to hearing the most on a new album are Jim's original tunes. He's outdone himself this time with his first foray into spoken word with the emotive 'The Journey Home' that takes his listeners through the sights and sounds of the bustling St. Louis of Jim Byrnes' childhood. The slow blues of 'Old Dog, New Tricks' with beautiful clarinet accents from Tom Colclough and the spiritually uplifting 'I Need A Change' prove once again that Byrnes is an artist with a lot of depth and a huge vocal palette while 'I Believe That Was A Lie' is as fine an homage to Jimmy Reed as anyone could ever hope to hear. The 250th anniversary of the founding of St. Louis and ten years of partnership with Steve Dawson may have had been the original motivation for recording St. Louis Times, but the sheer joy you can hear in the music Jim Byrnes and company create is the real reason to celebrate. Jim Byrnes is a living musical treasure and 'St. Louis Times' is his best record yet. And, that's saying something. There’s nothing more powerful than a good song and nobody knows that better than Jim Byrnes does. So, his decision to record an album of songs from the golden age of country music – many of which he’s been listening to for all his life - shouldn’t be all that surprising. Because when it all comes down - Rock, Blues, Folk, and Country – are only labels. And there was a time when those labels didn’t matter. Because if you know how to listen right, you’ll understand that there’s far less than a country mile separating Muddy Waters from Gene Autry. After all, Louis Armstrong and Jimmie Rodgers loved to sing together and you can bet they never once wondered if their collaborations confused their ‘target audience.’ And, as Jim loves to tell people, blues great Johnny Shines put it all into perspective for him many years ago by saying that Robert Johnson was the best country singer he’d ever heard. If a song is good enough, it can lift us up, bring us to tears, and heal a broken heart. That’s something that Jim Byrnes first learned many years ago when he was a kid in St. Louis, curled up in the living room and listening through his mother’s record collection. Ella Fitzgerald, The Mills Brothers, Louis Armstrong, Glenn Miller and all those great big bands of the day gave Byrnes’ his earliest musical education. This passion for a good song has never left him and he’s spent the past four decades of his life listening to, writing down, singing and sharing music with a dedicated core of fans and music lovers. With such an encyclopedic knowledge of North American popular songs at his fingertips, when the mood strikes him to go into the studio, he dives back into his record collection like a jungle explorer or old crusader in search of the Holy Grail. And if songs are like gold, Jim has come back from his latest expedition armed with treasure. A satchel full of songs drawn from the depths of the well of American and Canadian roots traditions is clutched firmly in his weathered hands. This time around, Byrnes turns back the hands of time to take his listeners into the world of country music, but it’s not the kind of country we’ve heard on the radio any time this century. The tales of lawlessness and tender love, recklessness and yearning, and tough as nails characters with sentimental flaws are songs that Byrnes sounds as if he was born to sing. With Jim’s compatriot, Steve Dawson back in the saddle again as producer and multi-instrumentalist (electric and acoustic guitars, slide guitar, pedal steel, baritone guitar, banjo, ukulele), I Hear The Wind In The Wires is surely the most natural, satisfying and downright joyous album of Byrnes’ lengthy career. Not just any musician can feel music like this and bring it to life, so when Jim and Steve hunkered down with their vintage equipment and gear for a four day recording session at Bryan Adams’ Warehouse Studios in Vancouver, they brought the cream of the city’s players in with them. With musicians like Geoff Hicks (drums), Chris Gestrin (organ, tack piano, Wurlitzer), Mike Sanyshyn (fiddle), John Reischman (mandolin) and Rob Becker (bass) on board, there’s not a single note wasted. The ensemble sings and plays with an economy and intuition that is missing from most modern blues and country records that favor over-playing and glossy production more than talent and authentic emotion. Take just one listen to Byrnes and Colleen Rennison of ‘No Sinner’ rave their way through ‘Wild Mountain Berries’ - the old Kenny Vernon and Lawanda Lindsey duet - before you hear him light into Little Willie John’s ‘Big Blue Diamonds’ or nail a truly transcendent take of Nick Lowe’s ‘Sentimental Man’ and you’ll be crossing your fingers and hoping that this is just the first of many such records and that that box set Jim is talking about is just around the corner. Until then, you’ll just have to let the songs on I Hear The Wind In The Wires knock the frown off your face, pick you up and dust you off before sending you out - six guns smoking – to go looking for love in all the wrong places. Some music simply can’t be played in the background. The first note catches you as the rest of the world melts away and you’ve got no choice but to stop what you were doing and listen. Really listen. Jim Byrnes’ new album, Everywhere West catches you that way. Listen closely and you can hear the wind blowing through the floorboards of long abandoned roadhouses. Wind that lifts up the dust ground down by the stomping feet of Saturday night dancers hurting, forgetting and testifying while Jimmy Reed hollered down the devil and ghosts of done me wrong romance. Open the door a little wider and some of that dust gets down your throat and all of that trapped passion and good time hurting becomes a part of you – just like the music of Jim Byrnes does. 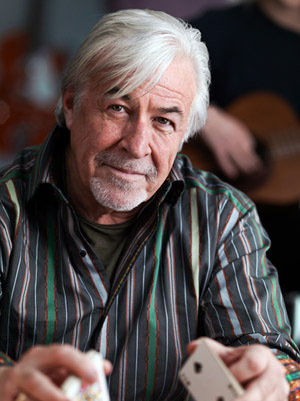 For more than thirty years, Jim Byrnes has woven roots so deeply into the Northern Blues scene that it’s difficult to remember that this quintessentially Canadian icon was raised in St. Louis and that his instantly recognizable gruff as sandpaper, sweet as honey voice was not always an essential part of the country’s musical landscape. As we’ve come to expect, the musicians who support Byrnes on this effort have been selected from the country’s best with Dawson studio regulars Keith Lowe and Geoff Hicks laying down a rock solid rhythm section while Jeanne Tolmie offers her usual heavenly back up vocals. Special guest Keith Bennett turns in some tasty harmonica parts while Canadian fiddle and horn legend, Daniel Lapp blesses listeners with some absolutely inspired performances throughout the album. Whether Byrnes is singing a Mississippi Sheiks chestnut like “Bootlegger’s Blues” or wailing his way through a stripped down banjo driven version of Bobby Bland’s “Yield Not To Temptation”, he effortlessly inhabits every syllable and corner of this music. Testifying with a poise and authority that few can muster, he adds weight and depth to a Dave Van Ronk inspired take of “He Was a Friend of Mine”. Defined by its yearning steel guitar line, Byrnes gives new life to old pain, showing that the blues can still cut like a razor when done right. Those who think that the world doesn’t need any more done me wrong songs only need to listen to Byrne’s worried to death version of Jimmy Reed’s “Take Out Some Insurance On Me” to realize how wrong they were, while a hip shaking good time version of Memphis Slim’s “No Mail Blues” reminds listeners that hurting or not, the blues has always been first and foremost about entertainment. Three Byrnes originals round out the album – “Hot As A Pistol” – a passionate straight up blues rave, “Storm Warning” – a first take recording with some hot trumpet served up by Daniel Lapp and finally, “Me and Piney Brown” – a lovely ‘autobiographical dream tune’ that evokes an imaginary journey to Kansas City in 1938. Pure and simple doesn’t get any better than this. When you hear Jim Byrnes pour his whole soul into singing a line as simple as ‘One sunny day, I’ll be home to stay’, you’ll instantly know that this is the kind of music you’re going to want to listen to forever – long after all other moods and fashions have faded away – and that sometimes time is on our side, and that nearly fifty years after first wondering ‘how blue can you get?’, Jim Byrnes has found his voice and is just hitting his stride. Introducing the latest blood and guts, behind your knees, love, life, death, and after life release from the legendary multi Juno Award winning blues and roots artist Jim Byrnes. This is the third album from Jim in ­five years since he hooked up with one of North America’s most critically acclaimed roots music producers, Steve Dawson. Byrnes and Dawson put together another world class band and 'My Walking Stick' finds them building on the blues roots of 2004’s Fresh Horses and 2006’s gospel tinged Juno Award winning House Of Refuge as they continue exploring gospel, blues, rockabilly, country, and once again pull it all together in an original and unique way. The opening track “Ol’ Rattler” digs in and never lets go and the same can be said for the entire album. Moving through the border radio groove of the title track, to the 50’s vibe of “Lookin For A Love” and a slow burning version of The Band’s “Ophelia”, these are tales of wanderers (“Three Shots”), lost souls (“Drown In My Own Tears”), love (“Living Off The Love You Give Me”), death (“What Are They Doing In Heaven Today”), and redemption (“One Life”). Those players are Keith Lowe on bass (Bill Frisell, Fiona Apple), Chris Gestrin on keyboards (K-OS, Randy Bachman), Jesse Zubot (Zubot and Dawson, Hawksley Workman), drummers Stephen Hodges (Tom Waits, John Hammond, Mavis Staples) and Matt Chamberlain (Edie Brickell, David Bowie) , critically acclaimed Vancouver based gospel trio The Sojourners, and of course Steve Dawson and Jim Byrnes.